Work continues on West Seventh Street traffic and safety improvements, and the next step addresses parking. Parking meters are being installed in and near the West Seventh area and are expected to be operating by Aug. 30. Parking fees for these meters will vary based on time of day. From 10 a.m.-4 p.m., the rate will be $1 per hour. From 4 p.m.-10 p.m., the rate will be $2.50 per hour. There is no fee from 10 p.m.-10 a.m. Parking fees may be adjusted by 25 cents per hour on a weekly basis based on demand, with a maximum allowable rate of $4.50 per hour and a minimum rate of $1 per hour. Fort Worth will be the first city in Texas to implement a demand-driven variable-rate structure for on-street parking. The combination of extended-hours metered parking and the implementation of a demand-driven variable rate has been successfully used in high-demand business and entertainment districts in cities such as Seattle, New York, San Francisco and Boston to address the issue of excessive parking demand and a limited supply of on-street spaces. The use of demand-driven variable-rate parking has resulted in a decrease in search time and congestion as well as an improvement in space turnover and overall business activity in high-demand districts in those cities. Parking will also be available at the Fort Worth school district’s Farrington Field, located at the corner of University Drive and Lancaster Avenue. Under a new agreement, 400 spaces will be available for employee parking and fee-based parking for the general public beginning Aug. 30. This effort is being managed by the West Seventh Restaurant and Bar Association. Fee-based surface lots and garages in the West Seventh Urban Village are additional alternatives. The availability of parking at Farrington Field will coincide with the opening of a portion of the new Trail Drive Extension adjacent to Farrington Field to allow easier access to the parking lot. The voter-approved 2018 bond program will provide $8.5 million to improve the right of way from the Trinity River west to University Drive for motorists, pedestrians, cyclists and transit users. Make plans to attend one of the upcoming community meetings to discuss the project. Meetings are scheduled for 6:30 p.m., Monday, July 30, Monday, Aug. 6, and Thursday, Aug. 16 at the University of North Texas, Health Science Center Carl E. Everett Education & Administration Building Room 406, located at 3500 Camp Bowie Blvd. Information presented is the same at all three meetings. 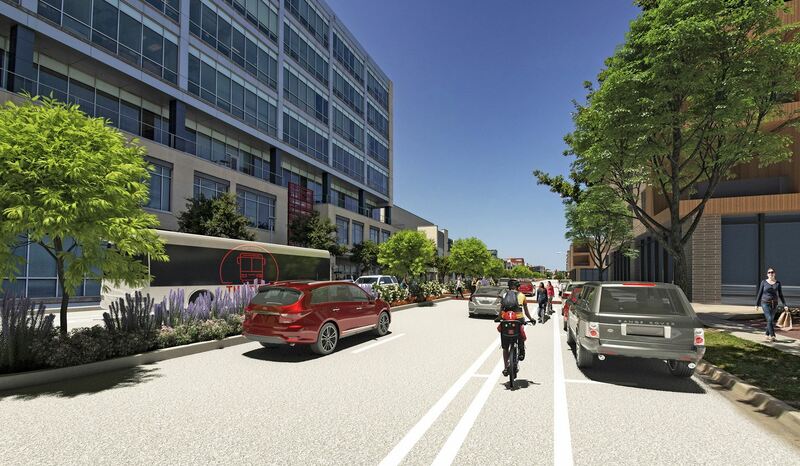 Proposed improvements include upgraded traffic signals, pedestrian crossings, shared bus/bike lanes, a median, improved sidewalks and illumination improvements. For more information, contact Project Manager Mitch Aiton at Mitch.Aiton@FortWorthTexas.Gov or 817-392-6591. Clear The Shelters is an adoption event like no other. It’s a one-day national pet adoption initiative with all fees waived. Last year, the Fort Worth community helped find homes for 300 pets at the shelter — a record-setting number of adoptions in one day. On Aug. 18, the Fort Worth Animal Shelter is teaming up with NBC5, Telemundo23, and more than 60 North Texas shelters and animal shelters across the nation to find loving and forever homes for pets in need. The Fort Worth Shelter is currently the temporary home for nearly 600 pets. It will be a family party at the shelter’s main campus, with nearly 20 organizations offering complimentary services and samples to pet owners as they look for their perfect new pet. The event will feature Kona Ice, Hollywood Feed, Urgent Animals Fort Worth, Carnival Catering, face painting for children, dog grooming and training from PetSmart and the Fort Worth Police Department’s Batman. The shelter’s main campus now features more than 10 outdoor play areas and a private “meet and greet” area. It’s important to have the entire family in attendance, especially kids, so everyone is contributing to the conversation about which dog or cat will be the best for the family. And don’t forget your current family dog. Shelter staff encourages “meet and greets” between new pet siblings. The main campus at 4900 Martin St.
PetSmart Adoption Center, I-20 at Hulen Street. PetSmart Adoption Center, I-35W at Heritage Trace. Parkway. Pets from the Fort Worth Animal Shelter are spayed or neutered, micro-chipped and vaccinated. Dust off your sneakers and join Mayor Betsy Price at the Mayor’s Back to School Basketball Showcase, presented by Code Blue’s After-Dark Basketball League. Games will be played 9 a.m.-2 p.m. Aug. 4 at Wilkerson-Greines Athletic Center, 5201 C.A. Roberson Blvd. Admission is $5 for adults and $2 for children. Free school supplies will be handed out while supplies last. Other sponsors include the Fort Worth Police Department, the Fort Worth Police Athletic League and DoYouBacktheBlue.org. The city continues to monitor traffic flow and parking in the West Seventh area, and adjustments are planned in the next few days. Some of the on-street diagonal parking on Bledsoe and Morton streets will be removed and the street operation will change from one-lane to two-lanes for continued traffic flow. Two lanes will enter each block and then taper to one-lane when approaching the intersections of University Drive and Foch Street. Additional signage to assist motorists exiting parking garages and alleys is also being installed. Parking meter installation will follow over the next few weeks and be complete by the end of August 2018. Morton, Bledsoe, Norwood and Foch streets in the West Seventh Street core were converted to one-way streets July 16. The traffic change was necessary to help with crowd control, improve access for emergency vehicles and reduce vehicle-pedestrian conflicts. 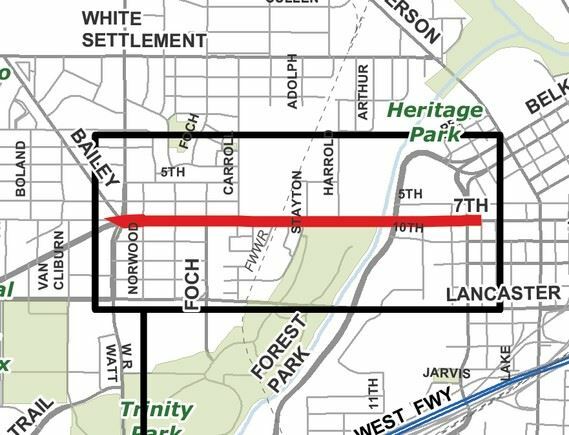 More changes are planned for the area in upcoming months that will go a long way toward improving the safety, walkability and accessibility of the thriving West Seventh neighborhood, one of Fort Worth’s fastest growing areas. For questions or more information, contact Ashley Hagen via email or by calling 817-392-2056. Two-way streets will convert to one-ways starting Monday. The West Seventh Street area is among the most popular places to hang out in Fort Worth. And the city is now just days away from debuting a series of changes meant to keep people safe. Four streets that are currently two way and run between an area bounded by W. 7th on the north and W. Lancaster Avenue on the south will soon be converted to one way: Foch, Norwood, Morton and Bledsoe streets. The change is scheduled to take place on Monday, July 16 and is expected to improve pedestrian safety and crowd control during busy weekend nights, as well as increase access to the area for emergency vehicles. In addition to the street changes, there are parking changes coming to the area. Two hundred parking meters will be installed beginning this month, and 400 spaces have been designated for public use in the nearby Farrington Field parking lot. Sidewalk improvements, including filling gaps in existing sidewalks and building all new sidewalks in areas where they do not currently exist are expected to begin in November and be completed by spring 2019. Fort Worth Mayor Betsy Price is among 50 mayors worldwide competing for the World Mayor Prize. Price was recommended for consideration for the 2018 World Mayor Prize by 17 individuals and organizations. These nominations were received before the mayor’s placement on the 2018 long list. Since then she has received further nominations from people within and outside the United States. The 2018 short list will be published in August, with the winner of the World Mayor Prize and Commendations to be announced in late January/early February 2019. The competition is organized every other year by City Mayors Foundation, a London-based group founded in 2004. The award recognizes mayors who have made outstanding contributions to their communities. The 2018 award will focus on women who serve as mayors. Organizers hope to encourage more women to contemplate a career in local government and run for political office. What does it take to construct a world-class arena? Approximately 1,839,564 man hours have been worked on the project so far. 3,544 workers have participated onsite. 800-900 workers are currently onsite. 2,200 tons of structural steel, equal to the weight of approximately 11 Boeing 747-400s. 1,000 concrete piers support the foundation. 8,800 tons of metal rebar. 87,000 yards of structural concrete. 10 miles of HVAC pipe. 41 miles of plumbing pipe. 710 miles of electrical wiring. 1.2 million pounds of ductwork covering 14 miles.